Scripture CD #2, Sing God’s Word – Way to Praise! 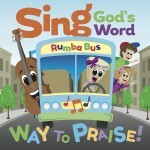 Sing God's Word - Way to Praise is our sequel to the first CD Sing God's Word - Psalms in Tune. The scripture songs and story line are from the Psalms and provide over an hour of entertainment. Continue to follow the adventures of Anthony, Kori, Matt Cello (M.C.) and many more musical friends from Symphony City. Kori's faith in God is tested when due to illness she can't get to church and feels very isolated from God. She learns through praising God that she can grow closer to Him which strengthens her faith again. The CD will be mailed to you within 1 week. The download links for the Coloring Pages and the Lyric Sheets are included with this purchase. The specific links will be sent to you by email once your purchase is complete. Tax (if applicable) and shipping and handling will be applied at checkout.